Higher-end Home Theater gear will frequently offer the option of using either RCA or XLR cables for your Analog Audio connections. The XLR choice is undeniably the Cooler choice! But if you've ever wondered whether there's any OTHER reason to use XLR cabling, this post is for you! XLR cabling was invented at Cannon Electric in the 40s as an improved (and smaller) plug format for cabling microphones. The original version bore the Cannon part number Cannon-X. A few years later, a locking mechanism was added to reduce the chance of the cable coming loose in use. That was called the XL. Then a few years after that, a rubber core was added to the female connector -- filling in between its three socket ends, as in the picture shown here. So by 1955, you had the Cannon-XLR, or just XLR -- which has since become generic for this style of plug. The modern world is awash in electrical Interference signals. These come from all sorts of sources including nearby electronics, or things like microwave ovens, or anything with a radio transmitter in it (such as a cordless house phone or cell phone), or even the electrical wiring both inside the walls of your house and on the utility poles outside your house. For the most part, these signals are not strong, but they ARE everywhere. And you don't want them messing with the quality of your Audio and Video! Radio frequency Interference typically manifests in your Audio as "Hiss". Lower frequencies typically manifest as "Static" or "Hum". The 60Hz Hum from power line Interference is something most of us have heard at one time or another -- not only because 60Hz emission from power lines is commonplace, but because 60Hz happens to be an audible frequency, so it is easily heard without first having to go through any strange, frequency-changing magic in your electronics. Your Home Theater electronics are specifically designed to Reject external Interference signals like this. Interference Rejection is accomplished both in the way the circuits are laid out inside each unit, and by the way the chassis of a unit shields the electronics inside it. But even the cleverest such designs are moot if your cables carry Interference signals in past all those defenses! And so, quality cables incorporate "cable shields", which run the length of the cable (surrounding the signal wires) and connect to the Grounded chassis of the devices at each end -- thus allowing external Interference signals to drain to Ground, harmlessly. When these shields are working well, the signal wires inside such Shielded Cables never see any external Interference signals. It's important to pause a moment and talk about Shielded vs. Unshielded RCA cables. Many moderately priced consumer electronics devices include "throw away" cables inside the box. The idea is to let people hook up their new gadget quickly, and avoid the dreaded Early Returns from buyers who simply can't figure out where to find a cable that works! And "throw away" is really the right term here, PARTICULARLY as regards the cheap RCA cables typically tossed in this way. Because those cheap RCA cables are UNSHIELDED. They provide NO protection against external Interference. Instead, you should buy a decent brand of Shielded RCA cables. The packaging will clearly tout the fact such cables are Shielded. Please note that the marketplace for Home Theater cables is rife with snake oil. There are exotically priced cables out there to match (and drain!) any bank account. I am *NOT* talking about such exotic cables here. What I'm talking about is well made, SHIELDED, RCA cables as distinct from the throw away garbage just described. Such cables need not be expensive. For example, both Monoprice and Blue Jeans Cable offer high quality, Shielded RCA Audio Interconnect cables at moderate prices. If you read my prior post on HDMI Premium Certified Cables you may recall my advice to always buy a 6 foot (2 meter) HDMI cable for use between devices, even when they were close enough together to not NEED that much length. That situation with HDMI cables is special -- peculiar to the specific implementation of HDMI transmitter and receiver electronics. For ANALOG cabling, on the other hand, the Rule of Thumb is that Interconnect Cables between any two devices should always be kept as SHORT as possible. Why? Because the longer the cable, the more chance external Interference has to penetrate the cable's Shield. And THAT'S why XLR cables are used in professional studios: Because (1) the cable runs typically are long, and (2) the Interference environment (from all the gear in the studio) is even worse! So how does XLR Cabling work? XLR cabling is Shielded Analog Audio cabling -- just like those better RCA cables I mentioned above. But it has an entirely new trick up its sleeve, too: A trick both fundamentally simple, and truly clever! An XLR cable sends the Audio signal two ways on the same cable! 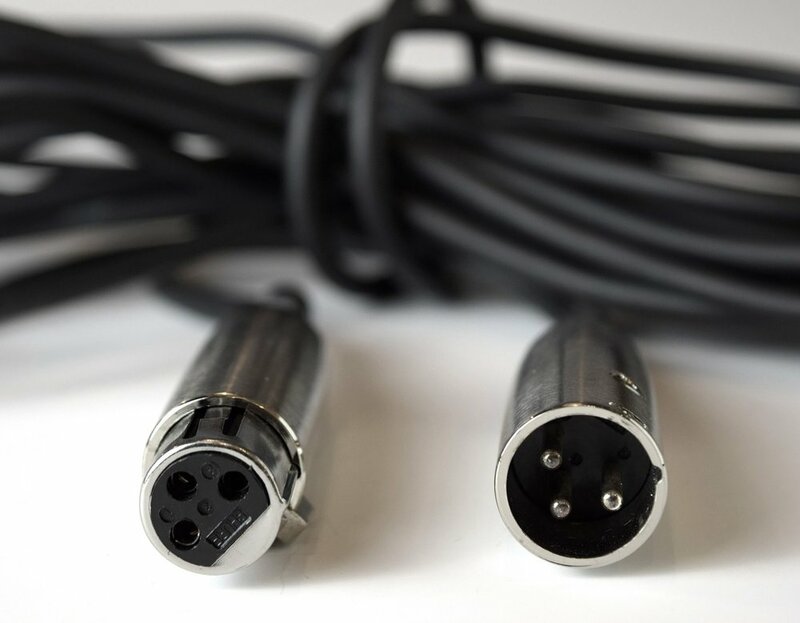 Those three pins in the XLR plugs connect to three wires running the length of the cable: One Ground wire and two Signal wires. One of those Signal wires carries the normal Audio signal -- just as you'd find in an RCA cable. The other Signal wire carries the SAME Audio signal but "Inverted" with respect to Ground. That is, one Signal is the "negative" of the other Signal. One Signal wire is SUBTRACTED from the other Signal wire. Now, the idea is that any external Interference which penetrates the cable Shield of the XLR cable will, in theory, affect BOTH of those Signal wires identically, and so by subtracting one Signal wire from the other at the receiving end, the effect of that external Interference is wiped away! It really works, and it really works well. It also has a side-effect which is not immediately obvious: The XLR signal is twice as loud as an equivalent RCA signal. Why? It comes from the math. So the voltage at the Receiving end is twice the voltage of the original Audio signal. If you recall from my post on use of an SPL Meter for balancing speaker volumes, that's the same thing as saying that XLR cabling is +6 dB "hotter" than RCA cabling. Depending on the gear you have at the receiving end of that XLR cabling, it may include -6 dB attenuation of the XLR input signal by default, or may have a switch setting letting you select to do that or not, according to convenience -- for example to match with other cabling. So should you use XLR cabling in your Home Theater? The electronics in your Home Theater may not offer the option of XLR cabling, in which case you should simply take care to arrange your gear so that you can use short lengths of decent, Shielded, RCA cabling. Note that -- barring design or manufacturing flaws in your gear -- there is NO QUALITY DIFFERENCE for the Audio itself between equally well made RCA and XLR cabling. So no need to feel you are losing something if you only have the option of RCA cabling. But as I said up top, there's simply no denying the Coolness factor of XLR cabling. So if you want to impress your friends, by all means go with the XLRs! You fear the Interference environment in your room is out of the ordinary. That last point deserves some comment. Most of the electronics you are using in your Home Theater will have had to pass FCC Certification (in the US; other standards bodies elsewhere) testing against emissions. That is, just because you've got a lot of gadgets in your Theater doesn't mean the Interference load must be high. Indeed there's typically MORE Interference coming from your wall power circuits -- or entering the room from external sources such as the feed wire for a Cable or Satellite TV system. The reality is that most Home Theater users will *NOT* hear an advantage from use of XLR cabling for their short-run Interconnect cables. What about running XLR cables with an XLR to RCA Adapter at one End? Folks who hear about XLR cables -- or who want to hang with the Cool Kids -- frequently think they can get most of the way there by running XLR cables with an XLR to RCA adapter at the end connecting to some device which doesn't happen to have XLR sockets. This is usually not a good idea. The problem is, the way the cable Shield works changes at the Adapter. The technical folks describe it with phrases such as "telescoping the shield of the XLR cable". What that really means is not important, but the side effect of it is that you can get "reflections" of the signal on the cable. Now these reflections travel at the speed of light, so you are not going to hear them as some sort of echo, but they can degrade the quality of the Audio signal you are trying to hear. It is not a sure thing this will happen -- it depends on how the gear is designed at each end of the combo cable -- but there's enough risk that I would recommend against relying on it. Are there Any Other Down-sides to using XLR cabling? Four come to mind: First, XLR plugs and sockets are physically bigger. So if you buy gear that features XLR sockets it will likely be BIGGER gear -- a bigger chassis -- to provide the extra real estate for sockets on its back panel. Second, some gear -- Audio Power Amps being the usual culprit -- are not designed to let you use both XLR and RCA cabling at the same time. So if you wanted to run XLR cabling for your Left Front and Right Front speakers (thinking to optimize your Stereo music listening, for example) while also running Shielded RCA cables for the other speakers you need to check the documentation for your multi-channel Power Amp to see if it is OK with that. If it *IS* OK, also keep in mind that you will need to compensate for the +6dB hotter XLR connections compared to the RCA connections. Third, the electronics at both ends of an XLR cable can be tricky to engineer well. Some gear is designed primarily for RCA-style connections, and generates it's alternate, XLR-style stuff as a step right at the socket. For example a source device might produce its Inverted version of the Audio signal right as its last step before feeding those three wires of the XLR cable. And similarly stuff can be happening at the receiving end. But some electronic devices try to offer a "Fully Balanced" design. That is, they follow the idea of running two versions of the Audio signal (one Inverted with respect to the other) through their ENTIRE internal signal path. And this is tough to do well! For one thing, some types of Audio processing are best done on a single signal. But that aside, the two signals running in parallel though the Fully Balanced design must be kept *COMPLETELY IDENTICAL*, both in content and in timing. That requires careful engineering using carefully matched components. Doing this well can add costs to the design without producing a useful improvement in quality. Now errors that creep in this way can be subtle -- difficult to hear unless you are experienced at this. So if you have a Theater configuration which calls for XLR cabling -- such as those far away Power Amps as one example -- you *SHOULD* use XLR cabling with confidence. The extra Interference Rejection you are getting for that long cable run outweighs any concerns such as just mentioned here. And finally, the fourth potential Gotcha with XLR cables is that there is no universal agreement on how to assign those three pins! For the most part, if you have Home Theater gear with XLR sockets at both ends, you will be able to use an XLR cable and it will "just work". But every now and again you will find a piece of gear which has chosen a different assignment (between Ground and Signals) for the 3 pins in its socket. If you get bitten by this, you should look to see if either the source or destination device offers a setting to configure its use of the XLR cabling. Just set either device to match the other (if you can) and you'll be good to go.